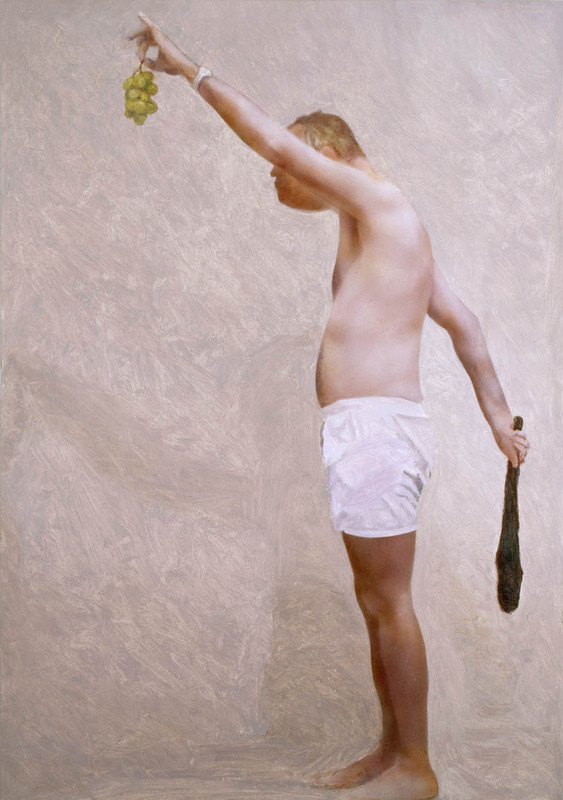 "Cro-Magnon Bacchus," a 2006 painting by Robert Feintuch, senior lecturer in art and visual culture. The major German newspaper Berlin Zeitung reviewed a gallery exhibition in Berlin by Robert Feintuch, a member of the Bates art faculty whose portraits of men offer wry explorations of powerlessness and vulnerability. Feintuch shows “thought-provoking, memorable, otherworldly lit, photorealistic — and at the same time surreal — scenes of powerless fighters, of brutes sinking in bed,” Ingeborg Ruthe wrote in the April 18 edition. Senior lecturer in art and visual culture at Bates, Feintuch showed recent work Feb. 18-April 28 at Berlin’s prestigious Akira Ikeda Gallery.